Well it’s that time of year again, the kids are back at school, football season is in full bloom, the days are getting shorter and colder, the leafs are turning colors and this can mean only one thing; Time for Pumpkin Picking! At Sussex County Strawberry Farm we grow and sell a wide variety of pumpkins and what can be more fun than picking the perfect pumpkin for painting or carving. It is a great way to have fun with the entire family and to get some really great shots of the little ones sitting in the pumpkin patch. So come on down to Sussex County Strawberry Farm and get your perfect pumpkins before that fun, fateful night we call Halloween. Sussex County Strawberry Farm opens it's gates for Pick-Your-Own Pumpkins the first week in October. It's an experience you and your family won't want to miss. It's fun for everyone...Why not make it a family tradition! Like Raspberries? We've got pick-your-own raspberries too! Available in September and October. Call for details! How to choose a pumpkin. Do you want it for decoration or eating? Decoration to paint or carve! OK, Then you need only look for any pumpkin that is visually appealing, evenly a deep orange. The shape is just whatever appeals to you. If it grew on its side and has a flat spot, you can either make that the make or use it as part of your design! free from cuts, soft spots, bruises,The flesh should feel hard, and not give easily. Infections can invade easily and cause rot. Make sure the stem is attached. Store it carefully, especially if you pick it from the vine yourself. Cure a fresh-picked pumpkin by keeping it in a dry place. Don't handle or disturb it. Curing toughens the rind, making it less prone to rot. Then you need a small, sweet type of pumpkin that has been developed for eating. They are smaller, typically about 8" to 10" diameter. The meat is much less stringy and smoother than a decorative pumpkin variety. Pumpkin is rich in vitamin A and potassium. 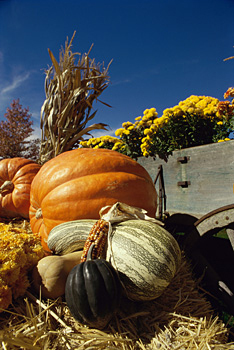 One-half cup of cooked pumpkin provides more than the recommended daily allowance of vitamin A. One cup of cooked pumpkin contains only 81 calories. It's low in fat and sodium! Usually you can get these at the grocery store, and some of the pumpkin patches and farm stands have them. Be sure to tell them that you intend to use it for a pumpkin pie. Again, look for firm, no soft spots, or signs of any rot.